Loewe has launched Agua de Loewe Mediterráneo, a new limited edition unisex fragrance. Agua de Loewe Mediterráneo is a flanker to 2000's Agua de Loewe, and is the first in a projected series of scents, Tesoros del Mar, that will pay tribute to the seas of the world. 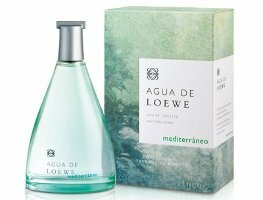 Agua de Loewe Mediterráneo is a fresh marine fragrance; the notes feature neroli, orange, tarragon, jasmine, lily of the valley, juniper berries, cedar, vanilla and musk. Loewe Agua de Loewe Mediterráneo is available in 50, 100 and 150 ml Eau de Toilette.